7. Double-Height Library Wall in ItalyLocation: Torino, ItalyWho lives here: A freelancer working from homeDesigner: MARC architects In this 1,075-square-foot flat (100 square meters), there wasn’t enough space in which to both work and live. The architects decided to take advantage of the area under the roof and demolished most of the ceiling that separated the apartment from the attic, creating a double-height space. The client asked for a big bookcase, so the whole wall was filled with shelves. 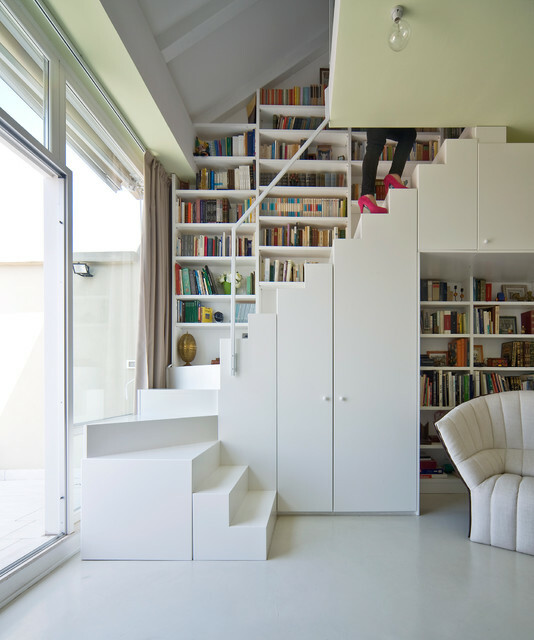 To make every book accessible, the architects designed a smart, L-shaped staircase that contains additional storage. The city of Torino is famous for its Gianduiotto chocolate, Fiat car factories and great views of the Alps. Fred Buscaglione, a noted Italian jazz singer of the 1950s, used to live in this building, and he would have enjoyed the same view of the mountains. Molto belli gli scomparti verticali che fungono da armali. Molto bello anche il fatto che i gradini siano tutti bianchi.